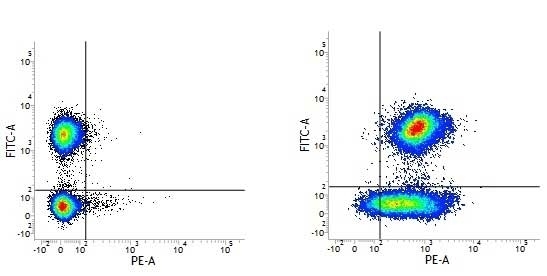 Figure A. FITC conjugated Mouse anti Human CD3 (MCA463F) and RPE conjugated Mouse IgG2a isotype control (MCA929PE). 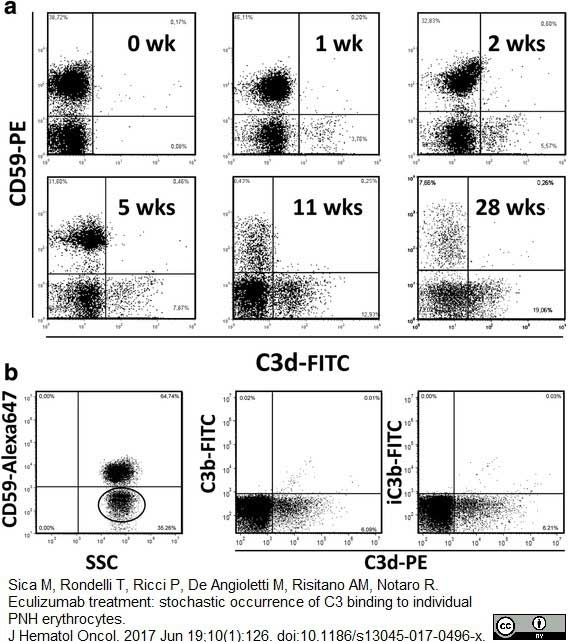 Figure B. FITC conjugated Mouse anti Human CD3 (MCA463F) and RPE conjugated Mouse anti Human CD59 (MCA1054PE). All experiments performed on human Peripheral blood lymphocytes in the presence of human SeroBlock (BUF070A). Mouse anti Human CD59 antibody, clone MEM-43 used for the detection of CD59 in virus infected cell lysates by western blotting. The effect of protease treatment on influenza virion associated host proteins. Purified influenza A/WSN/33 virus was either mock treated or subjected to overnight digestion with subtilisin followed by concentration through a sucrose cushion. 10 ug of mock infected cell lysate (lane 1) or influenza infected cell lysate (lane 2) and 2 ug of untreated influenza virions (lane 3) or protease treated influenza virions (lane 4) were then analyzed by western blot with antibodies against the indicated proteins. Numbers to the right are molecular weight markers. From: Shaw ML, Stone KL, Colangelo CM, Gulcicek EE, Palese P (2008) Cellular Proteins in Influenza Virus Particles. PLoS Pathog 4(6): e1000085. R-Phycoerythrin and Alexa Fluor 647 conjugated Mouse anti Human CD59 antibodies, clone MEM-43 (MCA1054PE and MCA1054A647) used for the evaluation of CD59 expression on human erythrocytes by flow cytometry. From: Sica M, Rondelli T, Ricci P, De Angioletti M, Risitano AM, Notaro R.
Eculizumab treatment: stochastic occurrence of C3 binding to individual PNH erythrocytes. J Hematol Oncol. 2017 Jun 19;10(1):126. Mouse anti Human CD59 antibody, clone MEM-43 recognizes CD59, a glycosyl-phosphatidylinositol (GPI) anchored membrane protein also known as membrane attack complex inhibition factor. CD59 blocks the formation of the complement membrane attack complex (MAC) by binding of C8a and C9. CD59 is found on all types of leucocytes including platelets and is also expressed on many non-haematopoietic cells. The epitope recognized by Mouse anti Human CD59 antibody, clone MEM-43 is lost after reduction therefore, non-reducing conditions are required for western blotting techniques. 2This product recognizes CD59 under non-reducing conditions. Stefanova, I. et al. 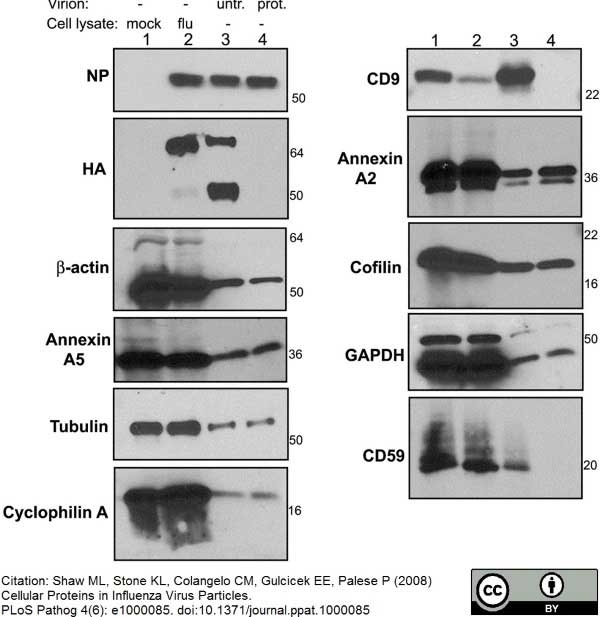 (1989) in Leucocyte Typing IV: White cell differentiation antigens. Ed. Knapp, W. et al. Oxford University Press pp 678-97. Stefanová, I. et al. (1989) Characterization of a broadly expressed human leucocyte surface antigen MEM-43 anchored in membrane through phosphatidylinositol. Mol Immunol. 26 (2): 153-61. Tandon, N. et al. (1994) Expression and function of multiple regulators of complement activation in autoimmune thyroid disease. Horejsí, V. et al. (1988) Monoclonal antibodies against human leucocyte antigens. II. Antibodies against CD45 (T200), CD3 (T3), CD43, CD10 (CALLA), transferrin receptor (T9), a novel broadly expressed 18-kDa antigen (MEM-43) and a novel antigen of restricted expression (MEM-74). Folia Biol (Praha). 34 (1): 23-34. Stefanová, I. & Horejsí, V. (1991) Association of the CD59 and CD55 cell surface glycoproteins with other membrane molecules. J Immunol. 147 (5): 1587-92. Shaw, M.L. et al. (2008) Cellular proteins in influenza virus particles. Shamri, R. et al. (2002) Chemokine stimulation of lymphocyte alpha 4 integrin avidity but not of leukocyte function-associated antigen-1 avidity to endothelial ligands under shear flow requires cholesterol membrane rafts. J Biol Chem. 277: 40027-35. Bonnon, C. et al. (2010) Selective export of human GPI-anchored proteins from the endoplasmic reticulum. J Cell Sci. 123: 1705-15. Zhang, J. et al. (2002) Early complement activation and decreased levels of glycosylphosphatidylinositol-anchored complement inhibitors in human and experimental diabetic retinopathy. Ellison, B.S. et al. (2007) Complement susceptibility in glutamine deprived breast cancer cells. Cell Div. 2007 2: 20. Cowan, P.J. et al. (1998) High-level endothelial expression of human CD59 prolongs heart function in an ex vivo model of xenograft rejection. Vanderplasschen, A. et al. (1997) Extracellular enveloped vaccinia virus is resistant to complement because of incorporation of host complement control proteins into its envelope. Proc Natl Acad Sci U S A. 95: 7544-9. Takemoto, M. et al. (2007) Human herpesvirus 7 infection increases the expression levels of CD46 and CD59 in target cells. J Gen Virol. 88: 1415-22. Chong, Y.H. and Lee, M.J. (2000) Expression of complement inhibitor protein CD59 in human neuronal and glial cell lines treated with HIV-1 gp41 peptides. Gendek-Kubiak, H. and Gendek, E.G. (2004) Immunolocalization of protectin (CD59) and macrophages in polymyositis and dermatomyositis. Abe, Y. et al. (2017) Glycan region of GPI anchored-protein is required for cytocidal oligomerization of an anticancer parasporin-2, Cry46Aa1 protein, from Bacillus thuringiensis strain A1547. J Invertebr Pathol. 142: 71-81. Sica, M. et al. (2017) Eculizumab treatment: stochastic occurrence of C3 binding to individual PNH erythrocytes. J Hematol Oncol. 10 (1): 126. Ueda, M. et al. (2019) Endovascular trophoblast expresses CD59 to evade complement-dependent cytotoxicity. Mol Cell Endocrinol. Apr 11 [Epub ahead of print].